“Average” is a word that contains negative connotations in our society. Nobody wants to be an average student. Nobody wants to be an average accountant. Nobody wants to be an average engineer, nor would they want an average mechanic fixing their car or an average carpenter building their house. Similarly, fans just don’t seem to get excited when they acquire an average or, even worse, below average player. Due to the limited supply of great or even good players, however, these players are absolutely necessary for a winning team. Let’s take a look at the distribution of talent as measured by WAR from last season. For simplicity’s sake, this discussion will be limited to the pool of position players. The supply of above average players simply is nowhere near enough for every team. Even when we restrict ourselves to players receiving over 300 plate appearances, we still see 137 of 305 falling below average and 28 of those 137 below replacement level. Of course, given the technical definition of average, that’s not surprising at all. 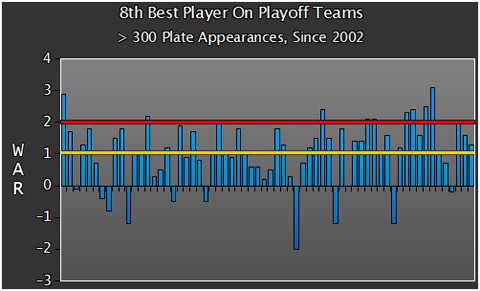 The problem with below average players is that they’re typically not members of playoff teams. At least, this is the perception. We know that each team must start at least eight position players. All but four playoff teams since 2002 have had eight players reach 300 PAs, which means these players played a significant role . 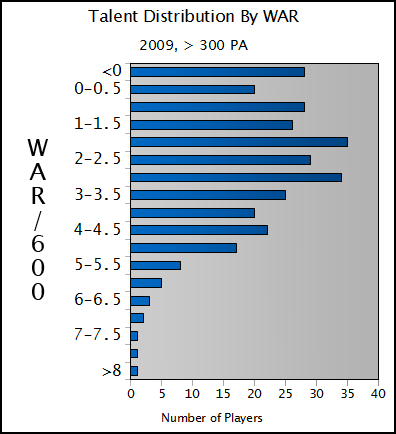 If average or below average players aren’t starters on playoff teams, we should expect the 8th best players on these teams, as defined by WAR per 600 plate appearances, to be above average players. Let’s take a look at these players. The yellow line shows the mean for this sample, and the red line shows 2.0 WAR, or league average as defined by the statistic. Remarkably, the average for these 8th best players – regulars in many cases, important players at the very least – is 1.0 WAR per 600 plate appearances, or exactly 50% of league average. These players have been average or above 11 times; they have been below replacement. There are few teams, if any at all, that wouldn’t benefit or wouldn’t benefit from the addition of a 1-1.5 WAR player, simply due to how many below replacement or marginal players have jobs. Of course, in some situations, the value of a player to one team is lower because of positional needs, but the data simply doesn’t support the notion of a below average player not deserving one of the 750 roster spots available in Major League Baseball. The next time you hear that your GM has picked up a player that projects as a 1-1.5 WAR player, don’t simply write him off as a guy to rot on the bench – he may be that last starter on the next playoff team. We hoped you liked reading The Value Of Below Average by Jack Moore! This is kind of a silly argument. If there are more average players, then replacement level moves up, and those players become below average again.